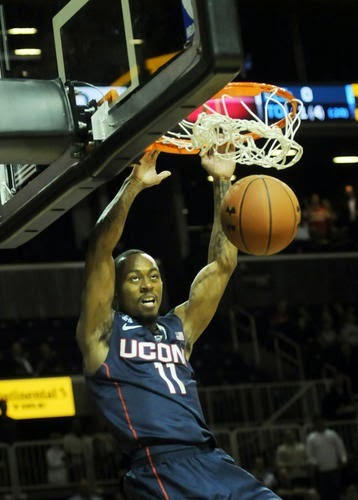 Looking Back: Ryan Boatright had a roll-a-coaster of a season. It started out strong and he looked to be taking a huge leap forward in production and leadership. He was knocking down key shots and playing tough nosed defense but then something happened in the middle of conference play and the wheels fell off his game. His jumper stopped dropping for him which led to him turning the ball over in key stretches and not running good sets. There were many times that he would dribble out the shot clock and then take an off-balanced jumper. Finally Kevin Ollie had to bench him in the crucial final five minutes of games. It didn’t look good for him heading into the American Conference and NCAA Tournaments, but that would change quickly. No one is exactly sure what flipped the switch for Boatright, but he not only came out of his slump, he exploded out. He became a menace on defense, creating easy scoring opportunities. His jumper that had been streaky finally started dropping for him and he cut down on his east to west dribbling and became a much more north to south player. It all added up to points at the line, easy plays for the big men when the help arrived, and convertible plays in the paint. Without his stellar post season play, UConn would’ve been early exits in both tournaments. The Good: It starts with his handle. He can change direction in the bat of the eye. He likes to lull his defender to sleep in one direction and then blast by him going the other way. When he does get a step, he has the athleticism to finish plays through contact. He has a lightning fast release and usually gets the shot off before his opponent can even react. He’s a tough nosed kid that will not back down and sometimes thrives after taking a hard shot. His on the ball defense is outstanding and he has the ability to lock down and take a player entirely out of the game. The Bad: While each year it has gotten much better, he still dribbles the ball way too much and without any concrete decision as to where he wants to go. It usually ends up with him running down the shot clock and heaving the ball up. His outside shot is also very streaky and tends to go on a two or three game stretch where his shot doesn’t drop for him. It is hard for him to adjust when that happens and he has some low scoring outputs. He also has had a hard time being in the right position, most notably when Napier had to shove him in the right direction in the National Championship game. Looking Ahead: The biggest question heading into the new season is his ability to handle the leadership role. The offense will flow through him much more and he will need to be more consistent which means get into the offense quickly and allow time to reset. If he can find ways to get to the line to counteract those poor shooting days and play defense like he did at the tail end of last season then he should have a great season.